Corte is the heartbeat of Corsica. 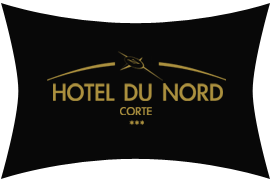 The Hôtel du Nord is located in Corsica, in the middle of Corte's main avenue, in Corsica.. The hotel attracts many types of customers, such as families, tourists … due to its location. The Hôtel du Nord, an old building erected in 1861, was renovated to offer guests more comfort without losing any of its charm of yesteryear. The rooms are equipped with an LCD TV with Satellite connection, a telephone, a hairdryer, a fan, free Wi-Fi connection, etc. In addition, we have a large conference room for business or student meetings. Our charming hotel also offers a snack-bar where you will be able to satisfy your desires and spend some quality time. For years now, we have been hosting tourists who are aware of our hotel’s reputation, but also locals who want to make the most of what the city of Corte has to offer. The hotel is located in the mountains, and a mere 30 minutes from the most beautiful beaches of the region. Please be aware that our hotel doesn't have room equiped for disabled people, as our reception is on the first floor of the building. At the beginning of the century, the Hôtel du Nord was a stagecoach post. It is indeed the oldest building in Corte! You will be able to shop in total tranquillity as the shopping streets are a stone’s throw away. We always offer the best of our services to embellish your stay. A stay in Corte is an invitation to discover an array of venues such as the Museum of Corsica, the Citadel of Corte, without forgetting the Regional Natural Park. You can go hiking or horseback riding to explore the valleys of Tavignano and Restonica where you can also take a dip in the beautiful natural swimming pools. Your every wish is within reach to offer you a dream holiday in the region. A parking area with video surveillance (€1 per night!) and only 50 m from the hotel.